Weekly lawn mowing is important for the warm season; however, many homeowners make the mistake of mowing too short in hopes of not having to mow too often. This is can really damage the grass and add to your weed problem. Ideally you want to not cut off more than 3/4 of an inch of the grass blades. This keeps your grass roots healthy and strong. Strong grass roots means less weeds. Ryno Lawn Care provides full service lawn care that includes mowing services and you can also add scheduled lawn fertilization, aerating and reseeding at the appropriate times of year. We Cater Our Services To The Unique Needs of Your Lawn in Prosper, TX. Our lawn care crews are able to handle yards of all shapes and sizes. Edging around flower beds and walkways. Bed cleanups. Trimming services. And more. You’ll get a free consultation to explain to us the problems you are having with your lawn so our lawn service in Prosper, TX can work to remedy them for you. Give us a call or fill out quote form for a free estimate and let us know if you need Prosper Sod Installation or Prosper Landscaping. 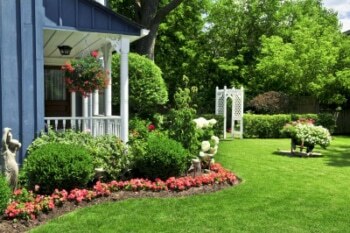 Increase your lawn’s elegance with our weekly lawn maintenance, fertilizing your lawn, and trimming shrubs around your property. Prices and details will be discussed with your free estimate.